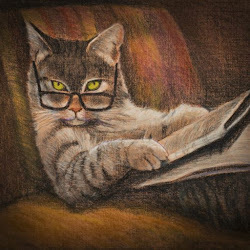 What's the latest scoop on cat litter? No, it's not another kind of ground corn, wheat, walnuts, pine, reclaimed wood or recycled paper. Just look out your window at the bird feeder and think safflower seeds. 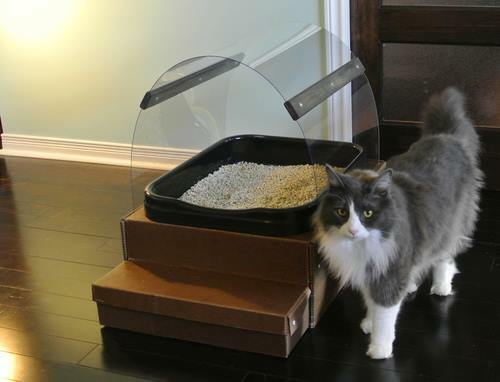 They're the filler for the new Cat's Ask (say that quickly, and ask sounds like an entirely different word) litter box developed by Mark Fenwick of Halifax Nova Scotia. With four cats, Fenwick admits he developed the new cat box out of desperation. He and his wife, Bernice, felt like they were literally sinking in clumps of yucky, smelly litter. After three years of research and testing, he launched a Kickstarter campaign earlier this month. So far, the project has raised $11,030 of its $48,971 goal. The Cat's Ask is a two-tiered box with a couple of wide steps leading to the pan that contains the safflower seeds. Urine is funneled through a grate under the seeds to a container below. To clean the box, you just have to scoop the solids and lift out and empty the container holding the urine. The box comes with a container, but you can replace it with any recyclable juice or milk carton. Spritz the seeds with a combination of water and vinegar to sanitize them and get rid of the cat smell, and you're done. Fenwick used safflower because it's an oilseed and repels moisture. Also, the seeds are the right size and shape to be easily composted. The box is made of waxed cardboard, and the pan that holds the safflower seeds is plastic. Fenwick says the safflower seeds need to be replaced just once a month, even if several cats are using the box. The Cat's Ask litter box should be available for sale in the spring. But I doubt that I'll be buying one. What my cats ask is to keep it simple: big boxes, unscented litter, easy in and easy out. This box sounds like it would be too much work for all of us.